C. ambigua of Michigan Flora. Roadsides, borders of fields and forests, and other disturbed places. 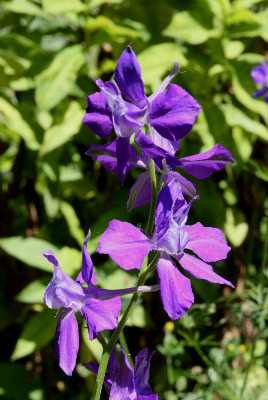 A native of the Mediterranean region, occasionally escaped from cultivation in North America. First collected in 1891 in Washtenaw Co.
Our application of this name follows Blanché & Molero (1993). Much material of this species has also been misidentified in American gardens as C. regalis Gray, which has the ovary and follicle glabrous and the lower bracts entire. Also, some material cultivated as C. ajacis is actually C. orientalis (J. Gay) Schrödinger, which differs in having shorter spurs (not over 12 mm) on the flowers, and bracteoles on the pedicels of the lower flowers reaching to the base of the mature flower and the fruit; in C. ajacis, the tiny bracteoles are inserted lower on the pedicels and do not reach the flower and fruit. All of our specimens have blue flowers, although other colors occur in the species. MICHIGAN FLORA ONLINE. A. A. Reznicek, E. G. Voss, & B. S. Walters. February 2011. University of Michigan. Web. 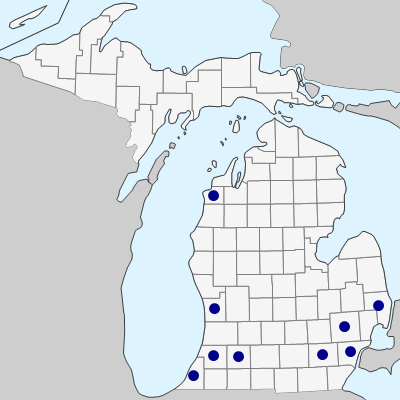 April 19, 2019. https://michiganflora.net/species.aspx?id=2370.